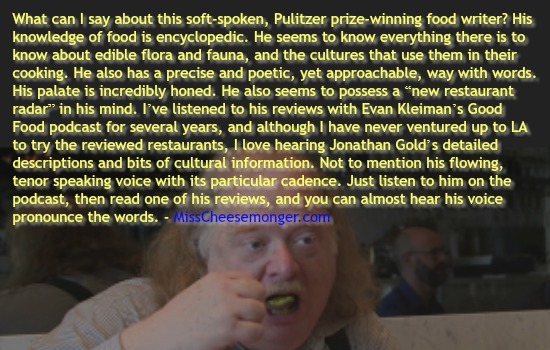 What Jonathan Gold, Los Angeles Times food critic/writer, has done for food writing journalism and for the restaurants that he loves, the movie, City of Gold has done for Jonathan Gold and Los Angeles and its surrounding environs – it has planted taco covered kisses on them. The movie is a love-letter to both Mr. Gold and Los Angeles. The documentary turns the notion that there’s no “there, there” in LA and flips it over like the many tortillas that Mr. Gold devours. Los Angeles, with its suburbs, the many neighborhoods and little “towns” and neighborhoods is home to hundreds of hidden food gems, quirky people, and a fascinating thriving sub-culture keeping the other side of the USA alive with a food culture that the rest of us can only dream about. Mr. Gold takes his readers and viewers of this documentary on the grand tour, sharing a taste of his world. For anyone remotely interested in eating, discovering a true culinary find, and wishing to talk about food, this is a movie for you. If you are an adventurer or an armchair traveler, this movie is for you. If you want to know what makes a food critic tick, this is the documentary to see. There is no standard fare here. The life that Jonathan Gold inhabits is one of pure indulgence. From hagfish to four alarm spicy food, Mr. Gold eats and knows it all. He writes in a clear, gonzo journalistic style. He suffers no pretensions in his writing or in his favorite dining choices. Be it a white table cloth bistro or a hot dog cart, Gold prefers honest food and efficient, knowing service. 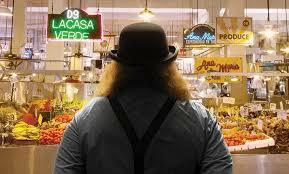 Jonathan Gold is a man who knows his food and Los Angeles. His style of writing sets him far apart from the other legitimate food writers out there. He’s become a literal “Gold Standard” for food journalism. His food finds are legendary. He sniffs out places so out of the way that even the locals in these off-the beaten path neighborhoods aren’t in the know yet. By the time he’s reviewed the strip-mall restaurant, taqueria, food stand, or pop-up eatery, the owners are dumbfounded as to why so many “others or white people” are lining around the block to get into their establishments. This has proven to be a blessing to many restaurateurs. Two proprietors interviewed in the documentary spoke of their relief when their businesses picked up over-night in thanks to Mr. Gold’s praises. One owner, on the brink of going out of business after the tragedies of 911, said that her Ethiopian restaurant was saved because of Gold’s review. When Mr. Gold thinks a restaurant is good, he makes it great for the rest of the world. At the heart of this documentary is the story of Mr. Gold himself. How he came to become one of the country’s best food writers in part due to his 1960’s Los Angeles Jewish upbringing; next via his musical interests, first as a classically trained cellist, then as a member in a punk rock band in the early 1980’s; his love of books and reading; and of course, his affair with the palate. Mr. Gold has written the map to all of the dining treasures within Los Angeles. City of Gold, the movie, is the key to deciphering both the city it beautifully depicts and the man who eats it best. Denine R. Gorniak, writes at TheBicycle-Chef.com, a blog full of recipes, photos, humor with a side-order of cycling tales. She is a mom, cook, and lover of all things relating to bicycles, food, film and food memoir-related. She has worked in the restaurant industry for over 20 years and has inside view of what life in the culinary trenches is truly like. Denine’s motto for her blog and life is: Laugh. Cook. Ride. I'm doing #WALKMS in Philly on April 30th. Please help me make my goal. I'm part of the Walkin' By Faith Team!